From The Topeka Capital-Journal. In the picture, Kansas Neurological Institute client Allen Jaimez helps client trainer Samantha Schappilly fill bags with sand for a balloon order. Jaimez pushes the button to make the machine pour the sand into the bag. Home for more than 150 people with exceptional disabilities is a sprawling campus unlike any other in Topeka. A team of 500 medical, occupational and direct-care staff members at Kansas Neurological Institute meet around-the-clock needs of an adult residential population with the following profile: 88 percent have profound intellectual disabilities, two-thirds are unable to walk, 82 percent can’t speak, two-thirds have a history of seizures and more than 90 percent have lived there at least a decade. Still, more than 130 residents hold part-time jobs. They live with a measure of independence in two dozen group homes that have little in common with the warehousing model common decades ago. With state government tax revenue falling off a cliff and a majority of Kansas legislators opposed to tax increases sufficient to recharge the treasury, budget cutting has sliced hundreds of millions of dollars in expenditures in the past year. A special state commission formed in January by then-Gov. Kathleen Sebelius is exploring potential closure, consolidation or relocation of at least six state facilities to save money. Targets include KNI and another state residential facility for disabled adults, Parsons State Hospital in southeast Kansas. Parsons serves approximately 200 people with developmental disabilities and employs 500 people. The state spends about $150,000 annually on each resident. At the same time, both facilities inject more than $25 million into the economy of Topeka and Parsons. “If you have to look at what the future holds, the future includes closing one of these institutions,” said commission chairwoman Rochelle Chronister, a former state legislator and secretary of the Kansas Department of Social and Rehabilitation Services. The 11-member commission also is weighing the future of Rainbow Mental Health Facility in Kansas City, Kan., Kansas School for the Deaf in Olathe, Kansas School for the Blind in Kansas City, Kan., and Beloit Juvenile Correctional Facility in Beloit. The panel’s report — due Dec. 1 — will be controversial. Sen. Jay Emler, R-Lindsborg, and chairman of the Senate Ways and Means Committee and member of the state facilities commission, said reform was a financial imperative. Blowback has been intense from every constituency on the radar screen of the Facilities Closure and Realignment Commission. Law enforcement officers in Johnson and Wyandotte counties have been fervent supporters of the 50-bed, short-term treatment facility for people suffering acute mental health episodes. Prairie Village Police Chief Wes Jordan, president of the Johnson County Police Chiefs and Sheriffs Association, said lack of access to Rainbow could force agencies to treat the mentally ill more as criminals than as people in need of treatment. Osawatomie State Hospital is a two-hour round trip for an officer, while Rainbow is no more than a 30-minute drive. During the past decade, hospitals in the Kansas City metropolitan area closed 700 inpatient psychiatric beds. He said officers were recently dispatched to a Prairie Village park on a report of an auto burglary in progress. Police found an adult male rummaging through cars. The man’s explanation: He was looking for cannibals. Advocates for the state’s schools for the blind and deaf have been equally resolute in advocating for those facilities. Kevin Enyart, a 1985 graduate of the School for the Deaf, worked as a mail carrier for more than 15 years. Mikel McCary, who graduated from the School for the Blind in 1995, said living in a dormitory with other blind students at the school provided academic, mobility and life skills that allow him to live and work in the mainstream. “The staff members were like parents to me. The students who were there at the time I was were more along the lines of siblings rather than classmates. We fought, laughed and learned together as a family might do,” McCary said. Less controversial, perhaps, will be a final decision about the juvenile facility in Beloit. The state’s Juvenile Justice Authority holds 350 teenagers in three correctional facilities. About 220 are in Topeka and more than 100 in Larned, with a couple dozen in Beloit. The state closed a juvenile facility in Atchison in December and is expected to save about $2 million annually. Shutting down the Beloit operation and shifting those juveniles to Topeka could reduce state expenditures by $4 million a year. “When you’ve got a $4 million budget and 20 kids, essentially, you’re spending $200,000 on each kid in the program. That’s expensive,” said Russ Jennings, JJA superintendent. Anyone who thinks this commission’s report will do nothing more than collect dust on a Statehouse shelf, may want to reconsider their conclusion. Rep. Bob Bethell, R-Alden, and chairman of the House Aging and Long-Term Care Committee, said the emotional weight of the commission’s task was overwhelming. He said a balance must be struck between the necessity of serving the needs of Kansans and respecting the budget challenges of state government. However, the state’s financial crisis makes reform of these state facilities unavoidable. “I do not believe the status quo is appropriate,” Bethell said. “Musical Minds,” the season premiere of “Nova” on PBS, is based on the neurologist Oliver Sacks’s most recent book, “Musicophilia,” a collection of case studies of people whose brains have unusual relationships to music, cases in which, as Dr. Sacks puts it, “music gets them going to an extraordinary degree.” A one-hour program can’t approach the depth and texture of Dr. Sacks’s book, but it does get at one question that nags the reader: What do these musical savants sound like? Or put another way: Are they really as amazing as they’re cracked up to be? Music isn’t my area, so I’m not going to hazard an answer other than to say that Derek Paravicini, an autistic and blind 29-year-old who is described as an “astonishingly, almost bafflingly brilliant pianist,” and Tony Cicoria, an orthopedic surgeon who began playing classical piano and composing after being struck by lightning, would be awfully impressive at your next party. “Musical Minds,” which with the season premiere of the newsmagazine “Nova ScienceNow” is inaugurating a Tuesday-night science block for PBS, looks at four cases. In addition to Mr. Paravicini and Mr. Cicoria, a third exceptional performer, Matt Giordano, uses drumming to help control his Tourette’s syndrome. Anne Barker, however, sits at the opposite extreme: she suffers from amusia, an inability to hear or respond to music. The narrator, the BBC reporter Alan Yentob, mentions that Ms. Barker has the condition despite the fact that her parents own a store specializing in traditional Irish instruments. Viewers are free to draw their own conclusions about cause and effect. Dr. Sacks’s trademarks as a writer are evocative storytelling and, just as important, a deep compassion for subjects coping with both the practical difficulties and the alienation caused by brain disorders. When those subjects are packed into 10-minute television profiles, an air of the carnival sideshow can set in, and “Musical Minds” is not immune to this, particularly in its depiction of Mr. Paravicini. His autism has caused speech patterns like those of a particularly loud talk-show host (an impression reinforced by his physical resemblance to the ubiquitous British presenter Graham Norton), and his hands, while striking the keys with impressive speed and precision, have a suspended look, as if attached to a marionette. Unfortunately, those are the impressions a viewer is likely to be left with. The best moments in “Musical Minds” tend to involve the program’s fifth subject: Dr. Sacks, who not only is interviewed by Mr. Yentob but also enthusiastically submits to having his own brain tested. These scenes are diverting, if not revealing. In one Dr. Sacks is scanned while listening to his professed favorite, Bach, and then to Beethoven. A Columbia University researcher shows him the scans: many more areas of his brain light up during the Bach, which proves that he indeed prefers the Baroque master to the Classical firebrand. But does it? As the program acknowledges, science still has little idea what those red and green flashes on the M.R.I. screen really mean. Which, in the meantime, makes Dr. Sacks’s work documenting the strange adaptations of our brains all the more valuable and mysterious. “Musical Minds” may barely scratch the surface, but it’s still full of fascinating information. Like this: Mr. Paravicini and Mr. Giordano each first demonstrated his unusual musical abilities at 2 — one by playing “Don’t Cry for Me Argentina” on the piano, and one by playing “I’m Just a Singer (in a Rock and Roll Band)” on the drums. There’s a dissertation right there. From SoftSailor.com. You can see a video of the device at SoftSailor.com. 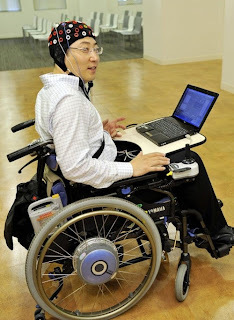 Toyota has developed a brain-machine interface (BMI), which transmits the thoughts of a user to a laptop and then to a wheelchair. BMIs were demoed before, but Toyota’s system is features a 125ms response time which means that it fives users the possibility to move easier and faster. Thanks to the Toyota BMI, a person in a wheelchair will turn right, left, move forward, backward only by thinking where they want to go. The key is how fast the commands take until they reach the wheelchair’s computer and how good it processes the commands. The BMI development was possible thanks to the BSI-Toyota Collaboration Center which consists of the Japan government research unit Riken, and Toyota. Now, the scientists are working on devices, which will allow aging people or people who need it to control them through brain waves. The system developed by BTCC consists of sensors positioned in the motion control areas of the brain in order to measure the electrical activity in that area. The sensors will pick up the electrical impulses and then send them to an on-board laptop to be analyzed in order to be passed to the wheelchair. If the laptop will not process well the electrical impulses or if something goes “wrong” then Toyota’s system features an emergency stop which can be activated anytime by the user by puffing his cheeks. The good thing about the BMI is that it “adjusts” itself over time as each user’s brainwaves are different. According to the researchers, the system will learn quickly and if a user will spend 3 hours a day, then the BMI will have a 95% accuracy in one week. Toyota is planning to commercialize this system very soon as it could have enormous implications in the healthcare system, but they have to increase the number of commands that a user can give to a device. The National Federation of the Blind (NFB) and the American Council of the Blind (ACB) filed suit June 25 against Arizona State University (ASU) to prevent the university from deploying Amazon's Kindle DX electronic reading device as a means of distributing electronic textbooks to its students because the device cannot be used by blind students. Darrell Shandrow, a blind ASU student, is also a named plaintiff in the action. The Kindle DX features text-to-speech technology that can read textbooks aloud to blind students. 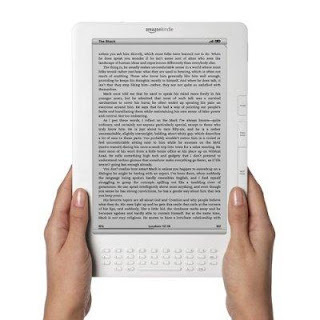 The menus of the device are not accessible to the blind, however, making it impossible for a blind user to purchase books from Amazon's Kindle store, select a book to read, activate the text-to-speech feature, and use the advanced reading functions available on the Kindle DX. In addition to ASU, five other institutions of higher education are deploying the Kindle DX as part of a pilot project to assess the role of electronic textbooks and reading devices in the classroom. The NFB and ACB have also filed complaints with the Office for Civil Rights of the U.S. Department of Education and the Civil Rights Division of the U.S. Department of Justice, asking for investigations of these five institutions, which are: Case Western Reserve University, the Darden School of Business at the University of Virginia, Pace University, Princeton University, and Reed College. The lawsuit and complaints allege violations of the Americans with Disabilities Act (ADA) and the Rehabilitation Act of 1973. Dr. Marc Maurer, President of the National Federation of the Blind, said: "Given the highly-advanced technology involved, there is no good reason that Amazon's Kindle DX device should be inaccessible to blind students. "Amazon could have used the same text-to-speech technology that reads e-books on the device aloud to make its menus accessible to the blind, but it chose not to do so. Worse yet, six American higher education institutions that are subject to federal laws requiring that they not discriminate against students with disabilities plan to deploy this device, even though they know that it cannot be used by blind students. "The National Federation of the Blind will not tolerate this unconscionable discrimination against and callous indifference to the right of blind students to receive an equal education. We hope that this situation can be rectified in a manner that allows this exciting new reading technology to be made available to blind and sighted students alike." Darrell Shandrow, a blind student pursuing a degree in journalism at ASU, said: "Not having access to the advanced reading features of the Kindle DX-including the ability to download books and course materials, add my own bookmarks and notes, and look up supplemental information instantly on the Internet when I encounter it in my reading-will lock me out of this new technology and put me and other blind students at a competitive disadvantage relative to our sighted peers. "While my peers will have instant access to their course materials in electronic form, I will still have to wait weeks or months for accessible texts to be prepared for me, and these texts will not provide the access and features available to other students. That is why I am standing up for myself and with other blind Americans to end this blatant discrimination." At age 34, Jason Crigler was a rising star in New York City's East Village music scene. He was awaiting his first CD release and expecting a new baby with his wife, Monica. (The two are pictured in 1999.) Meanwhile, he had plenty of gigs, both as a backup guitarist for such popular performers as John Cale, Marshall Crenshaw and Linda Thompson and as a performer in his own right. It was during one of these latter shows in the summer of 2004 that Jason abruptly fled the stage in pain and confusion. Later, in the emergency room, Monica and the rest of the couple's family learned the awful truth: The young, healthy musician had suffered a life-threatening brain hemorrhage. In the opinion of the doctors, even if Jason made it through the night, he would remain in a vegetative state. In the face of this daunting medical pronouncement, and after Jason did make it through the night, Monica and the Crigler clan took a courageous decision — they would believe in Jason and, joining forces, conduct an intensive, round-the-clock care and rehabilitation program to bring him back to the life they believed was still in him. As poignantly documented in the new documentary Life. Support. 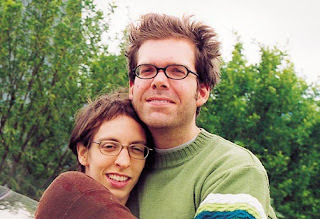 Music., by Jason's friend, filmmaker Eric Daniel Metzgar (The Chances of the World Changing, POV 2007), the Crigler family didn't just confound the doctors and conventional wisdom about what can be accomplished for brain-damaged people — they even astounded themselves. "I was whisked away in an ambulance and that's the last thing I remember for a year and a half" is the way Jason remembers the ordeal portrayed in Life. Support. Music. But for Monica (who would give birth to a girl, Ellie, during that time) and the couple's families — the Criglers and, on Monica's side, the Cohens — it was a time of intense activity, tight schedules, setbacks, constant worry and dedicated optimism in the face of seemingly impossible odds. Friends also lent a hand, and musicians Norah Jones, Crenshaw, Thompson and others held benefits. But nothing could replace the collective effort at extended, round-the-clock rehabilitation — which few brain-damage victims can have — provided by Jason's extended family. What amazes is not just the effort the family mounted, but their unwavering belief in Jason's full recovery. "Scientifically, he wasn't there," says Dr. Christopher Carter, who treated Jason. But the family always believed he was there. Weaving early footage shot by the staff of Spaulding Rehabilitation Hospital in Boston showing Jason's first excruciatingly slow steps at rehabilitation and home movies taken after he came home with the agonized reflections of Jason's family, doctors and friends, Metzgar has crafted a painful yet poetic account of his friend's return from nowhere. If anything, the early footage seems to confirm the doctors' expectations — Jason looks mentally absent, with serious motor-function impairments. When Jason was at Spaulding, the family arranged to visit him daily to supplement the staff's efforts. Upon his release — and against the advice of some specialists — the family decided to care for him at home in Cambridge, Mass., near his wife's parents' residence, rather than place him in a nursing facility. At that point, the $1 million cap on Jason's medical insurance had been reached, and while the family awaited a decision on a pending Medicaid application, they were essentially on their own in providing for his care. Once Jason got home — the point at which most brain-damaged people are considered to have recovered as much as they are able — the family continued their constant rounds of care, rehabilitation and stimulation. Progress was slow and set-backs were devastating, yet the family's optimism shines through in the film. The moment Jason picked up a guitar and began to play again was the milestone that seemed to validate the family's faith. For Jason, it was both a thrilling and bittersweet return to music. "I had trouble connecting," he says in the film. Then, at Jason's first concert in New York after his injury, something clicked and he suddenly connected with the music. "It's the first gig I played that I felt really good," he later said. That was the moment, a year and a half after his brain hemorrhage, when things turned around. At an extraordinary get-together afterwards, the family members recall the journey they have taken together with some degree of astonishment as well as quiet relief. Though they allow that Jason might be 90% recovered, and that the effort to achieve full recovery will continue, they realize their collective effort has succeeded against all odds — and transformed their own ideas of family and faith. "I knew Jason before this tragedy struck," says filmmaker Metzger. "I got a call — 'Jason's in the hospital. It's touch and go.' A few hours later I was looking down at Jason on a hospital bed. "For months, I was in the email loop, receiving occasional updates about Jason's condition, Monica's pregnancy, the surgeries, the setbacks. But these updates, sent by the Criglers to their vast web of friends, were more than just informational. There was an incandescent love in these letters. Later, when the Criglers asked if I would consider making a documentary about the whole saga, I knew their beautiful optimism amid the heaps of suffering would be the story. Of course, I underestimated the entire thing." Life. Support. Music. is a production of Merigold Moving Pictures. 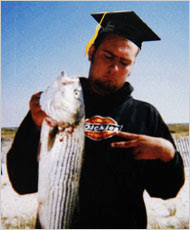 FREEPORT, N.Y. -- The invitation for Dan Mulvaney’s graduation Sunday showed a burly young man with a hipster’s goatee wearing a graduation cap (courtesy of Photoshop) and holding a real striped bass he caught in the bay behind Long Beach High School (pictured). It read: “ ’Twas said that by teaching a man to fish you feed him for a lifetime. You could sense that indescribable pride Friday as his father, Jim Mulvaney, watched his son at work at the recreation center in this Long Island suburb just across the bay from their home. After all, Dan holds down two jobs, at the recreation center here and the Lakewood Stables in West Hempstead. He’s getting ready to move into a house with three friends. He cooks — mostly pasta — and picks up after himself and does his chores at home better than most of his peers. His mother, Barbara Fischkin, says when they walk on the boardwalk in this unpretentious seaside town, more people greet him than her. Dan often accompanies his father to a local bar like Geri’s or John Henry’s, nursing a Sprite and picking the olive out of his father’s martini. At 21, he has even managed to learn to say a few words — hi, mom, dad, more, food, bathroom and a few others. He may indeed be ready to take on the world, but at the very low end of the autism developmental scale, he’ll take it on with very limited tools. He’ll almost certainly need a full-time caregiver for the rest of his life. Every graduation has its own history and conflicting story lines — pride, nostalgia, joy, achievement, regret, separation. It’s hard to know who’s in for more change and who’s better prepared for it, the graduate or the parents. But this is a graduation that seemed unlikely to happen, so you can multiply all the emotions by 2, 3 or 10. Dan seemed on a normal developmental track for his first three and a half years until things went haywire. His speech suddenly stopped. He sat in a corner gnawing on his shirt. His parents first thought it would pass, then that it was a hearing issue, and finally the cold, terrifying diagnosis came. As a middle school student he was isolated from other children and placed in the corner of a foyer where the solution was to let him bounce on a trampoline, ride an exercise bike and nap as frequently as possible. His parents were told that at least one teacher referred to him as “an animal” from whom other students needed protection. The school district insisted that Dan be sent to an institutional setting, an idea his parents balked at even before a state official had warned them that a school recommended by the district had problems with pedophilia. And for all the expense and havoc, the $50,000 yearly baby-sitting bills, the disruption he created to careers and relationships, they didn’t want their son in an institution. They wanted him in a local school and in his own house. SO instead, with the assistance of the district’s head of special education, Mary Tatem, they pushed and prodded, became total pests, made themselves and the district crazy but ended up with the best education Dan could hope for, one where he ate with other kids and became part of their world — good for him, good for them. And along the way Long Beach transformed itself from a district that barely knew how to deal with special-needs kids into one of the best in the region. None of it is perfect. How could it be? But Sunday, Dan was coaxed into putting on his graduation gown and, after halting for a moment as if pleased and surprised by the enormous burst of applause, received his diploma. About 60 people came to his house to celebrate — parents, teachers, advocates for the autistic, his pediatrician, the friends who greet him on the boardwalk. On Monday, he goes off to a summer camp, and then he’ll begin his new life at a group home. And he and his parents, like so many this time of year, will start anew with both a new set of possibilities and unalterable ties to the life they’ve somehow suddenly, miraculously outgrown. Every summer for the past 11 years, Nick Larkin has looked forward to going to camp - one where he isn’t the only kid in a wheelchair. “It’s just kind of a relief to feel normal because all the kids there have the same disease,” said Larkin, a 17-year-old Danvers High School senior who spends one week every summer swimming, horseback riding and kayaking with dozens of other youngsters who have muscular dystrophy. But June 26, a Muscular Dystrophy Association representative called their families to say next month’s camp had been canceled because 17 cases of swine flu had been detected at other association-funded camps - in Minnesota, Pennsylvania and Utah. Parents, however, had already obtained their pediatricians’ OK for their children to attend the camp and believed that any potential risks were outweighed by the benefits. “He gets to see friends he’s made from past summers, and for that one week, my 14-year-old daughter gets to be the focus of all my attention,” said Larkin’s mother, Lauren Ferrari. Nearby, in the town of Beverly, Natalie Gaudenzi was having similar thoughts. She had seen her 14-year-old son, Max (pictured), flourish at camp in summers past, while she and her husband got a brief respite as his caregivers. So she had an idea: What if they could raise the nearly $24,000 it would cost to send 35 youngsters to camp? Gaudenzi decided to try, but time was of the essence. So she set up a Web page and hoped word would spread in time. Now there is reason to hope: By last night, the page had $7,520 in donations. Mud, big crowds, dodgy toilets and 1,000 acres of mayhem - they are all part of the essential Glastonbury experience. But for some fans they also present huge practical challenges. For Paul Carter, an amputee who has lost his legs, the main problem has just been getting around the massive site at his first Glastonbury. "On Friday I didn't leave my tent until two or three o'clock in the afternoon because I was just not prepared to go out in the mud," he says. "And then it was a bit of a deathtrap. We had to find a space near the Pyramid Stage and just stay there all day." Mr Carter, who is writing for Disability Now magazine, adds: "They can't control the weather and it is a farm at the end of the day and there's only so much they can do, but it doesn't make it any easier on us." And of the festival's notorious toilets, he says: "If you find out where the accessible toilets are, they're usually quite good because they're usually reasonably clean and reasonably tidy. Finding where they are is the tricky part." More and more disabled fans are coming to the festival as organisers attempt to make it simpler to get around - even if the mud is here to stay. Since 2005, the festival has been advised on improvements by Attitude is Everything, an organisation that works for better access to live music. They help run the disabled campsite, which now has 1,000 campers, including designated personal assistants and a limited number of friends. "The way that it's laid out is designed to be accessible," says Attitude is Everything's Graham Griffiths. "If you camp in one of the other fields, you've just got tent upon tent upon tent and guide ropes everywhere. Here, there are accessible lanes so you can get out and about and move around the site easily." The campsite's other facilities include accessible toilets and showers and charging points for motorised wheelchairs. "We've really seen a lot of changes year on year with a lot of the things we've suggested being implemented," Mr Griffiths says. "They've got a second viewing platform at the main stage this year. 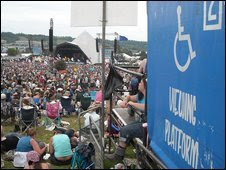 They've also introduced a shuttle bus that takes disabled people from the accessible campsite around the site." Tony Lawson had been to the festival three times before a motorcycle accident in 1993. "Ever since then, I've needed crutches and walking sticks. I have mobility problems," he explains. "Now, with the disabled campsite and everything, it's great. But years ago I just had to come with a bunch of friends and they had to carry the gear. "Getting around the site is difficult but you live with it." Mr Lawson is now at Glastonbury for his 16th time, and has experienced some legendary mudbaths over the years. But he has one advantage in a quagmire, he says. "The crutch always goes down first and tests the ground before you walk on it, so I probably fall over less than anybody else when it's muddy." This year, for the first time, one of the stages has been given over to disabled artists for a day. The stage, in the Shangri-La area of the festival, was hosted by Club Attitude, which also puts on regular gigs and club nights in London and beyond. For Rob Maddison, singer and guitarist with Spaceships are Cool, playing Glastonbury was "a dream come true". "This time a year ago I was still in hospital and thought I might not be doing music again, so to come and play Glastonbury Festival with my own band was excellent," he says. Mr Maddison started the band in 2006 but was diagnosed with a rare spinal tumour in February 2008. He now uses a wheelchair and his Glastonbury appearance came a year to the day after leaving a spinal rehab unit in Sheffield. "Everybody's been overwhelmingly helpful and it's certainly encouraged me to think I'd try the whole camping experience and be here for a few days next year," he says. But the wider live music scene needs to do more to provide better access, he believes. "I've been gigging as a musician for 15 or 20 years, completely ignorant of how much I took for granted - like if a venue is downstairs, which a lot of them are," he says. "I've done shows where I've literally had to be carried up four flights of stairs in a venue packed with people, and it's just not safe." Club Attitude promoter Graeme Wall says things have improved, and bands like Mystery Jets - whose singer Blaine Harrison has spina bifida - have forced people to think about the issue. But he is keen for his gigs to avoid being known as disabled nights. "We've always been clear that what we didn't want to do is create another ghetto," he says. "We don't organise gigs that only have disabled artists on, or that are only aimed at bringing disabled audiences in. That isn't the point. "The club has got a reputation for being accepting of non-mainstream music and attitudes, so people will come along just because they know it will be an interesting night." Most music venues are keen to make things easier, he says, even if obstacles will always remain. "At the end of the day, obviously there are physical things you can do to improve access to a venue. "But what makes a huge difference is just having a positive attitude towards trying to make sure that somehow you make things work." LP actor Marcia deRousse joins HBO's "True Blood"
Recently we had the great pleasure of talking to Marcia deRousse who will be playing Dr. Ludwig on June 28’s True Blood episode, “Scratches”. She’s been in such films as Tiptoes, And The Award Goes To… , The Grannies and Under The Rainbow and in familiar TV shows including The Fall Guy, St. Elsewhere and Highway to Heaven. 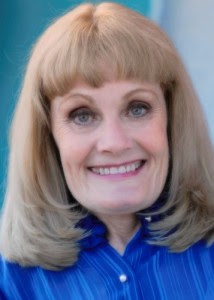 She also does stand up comedy and plays including ‘The Sugar Bean Sisters” for which she was nominated for Best Actress by the Ticketholder’s Awards. She took most of the nineties off to take care of her sick mother but returned to acting in 2000 after her mother passed. Oh, and she just happens to be a little person. It was funny because when I was at the university of Missouri, Columbia and wanted to declare an education major, I went to the office and the secretary handed me the form for elementary education, I asked for the K through 12 form because I really wanted to teach Junior High and High School. She looked at me and said, “You can’t.” I asked why and she said, “You’re too small.” I looked at her and I blinked and asked, “What does that have to do with the price of tea in China?” She replied that, “You’d never have any respect from kids that were bigger than you.” So I walked down the hall to my advisors office, and he went back and told her, “Give her the forms, she can teach anybody she wants to teach.” And he made the woman apologize to me. The funny thing was I always ended up being the most beloved and respected teacher in the school because we’d have the first day, and I’d say, “You can ask me questions, don’t be rude but ask questions and we’ll discuss it and then we won’t talk about it any more. It becomes a non issue, my size is a non issue. I’m still your teacher, I’m still older than you. I’m here for you to learn from me and I’ll learn from you.” And it always worked. People would think it was funny because during break time I’d be walking through campus and there would be these big kids following me calling, “Miss deRousse, Miss deRousse, Miss deRousse”. People from farms said it reminded them of banty hens which sit on big eggs and before long after they hatch the babies are much bigger than the mother but they’re still following heraround! They thought the kids following me reminded them of that. Marcia: Because I was different anyway, I learned early on that I could either use that, or I was going to get slaughtered by it. So I became the class clown, plus I was the smart kid; I had that strike against me as well. I realized I could either learn to have people laugh with me or at me. I could entertain them and have them on my side or I could have them picking on me. I would actually go to bed at night and pray, “Please, God, please give me a good sense of humor, let me be funny. ” And one day it just happened! Marcia: When I first moved out here, I had my teaching degree in hand and was working at Braille Institute. I is on the corner of Vermont and Melrose which is in the Hollywood area. I was taking acting classes and developing. My acting teacher at the time was Gerald McRaney who went on to be a big star in “Simon and Simon”. I was a very ’serious’ actor. I went up to the bank at lunch time to deposit my check on a Friday afternoon. There was probably a little PMS going on, I was a little on the grumpy side and the bank line was long and I was irritated. This little guy came up and tapped me on the shoulder and I said, “WHAT?” and he said, “Oh! Have you heard about the movie that Billy Barty is doing called ‘Under the Rainbow?” And I said, “No.” I mean I was awful! I look back on it now and I just want to slap myself. He said, “Well he’s still looking for more little people to be in it and here’s his phone number, I’m going to write it down for you. Why don’t you give him a call and tell him that Ed Valentine told you to call?” I’m thinking, “OK everyone’s a producer here in Hollywood, I might as well take it or he won’t leave me alone!” So I took his card and put it in my pocket.. and I was called up next in the bank line and when I turned around after he was gone. I had started thinking, “What a jerk you were.” It’s really not how I am but it was just one of those times! Marcia: I hope so, in the book it is. She comes back twice more in the books. One of my friends who’s a real True Blood addict said, “I think those folks ought to have Dr. Ludwig on speed dial because they’re always getting hurt.” You never know, because look what they did with Lafayette! He died in the books but in the series they brought him back. It’s funny, this morning on my Facebook [Editor's note: her Facebook name is marcia.derousse for those that would like to friend her] I took the test to find out “Which True Blood character are you?” and I turned out to be Lafayette! And I thought, “This is perfect because not only do I love his character but he comes back!” So you never know. I have no inkling at all of what they’re going to do but who knows, if they decide to, they can bring her back. Marcia: One thing that really strikes me is that it is addressing so many of the prejudices that this world has that’s focused towards the vampires. And they address that, they show how ugly it is to be looked down upon and separated. And with the vampires they’re weaving in the shape shifters according to the books, the werewolves. Again, I don’t have any idea what they’re anticipating doing. But they are bringing in all these creatures that for me, being such an imaginative kid, I always believed they were real. In my head, they were real. So seeing them on the show, I like these characters. I like these beings. I like them so I wouldn’t be afraid of them.. except maybe Eric! But Dr. Ludwig’s not! I think they show the humanity in these characters and I think that’s beautiful. His [Stephen's] dog came in with him and his dog straight up to me, because dogs always know when you can talk to them, the dog came straight up to me and said, “Hi! I want you to tell him that I’m not a dog!” I sat there for a second then looked at him and said, “Your friend here says to tell you that he’s not a D-O-G.” He looked at me and he blinked and said, “Well that’s exactly what he thinks!” Well that’s what he told me. So he thought that was pretty funny. They all treated me as if I’d been there forever as well and that was just lovely. And that doesn’t always happen either. Also, something that doesn’t necessarily say, “Little Woman” on the call. Because I am first of all a human being. But that’s a fight that all people that are different, whether it’s little people or people with disabilities.. we have to work just a little bit harder than everybody else. We have to be just a little better; we have to shine just a little brighter. I’m working on it! I did audition for that kind of role on a sit-com the day that my kittycat Snowflake died. I knew she was dying and she told me to go, I didn’t want to leave her but that is actually still pending to do a sit-com with that role so keep your fingers crossed. Because again, she’s a feisty one! I don’t know how I get these feisty roles! In early July, millions of people in the country, including thousands of disabled soldiers, may get the hearing they have been waiting for, when the Supreme Court hears a Fundamental Human Rights petition brought before it. It will be the opportunity to ensure access with dignity, like everybody else, to the country’s public buildings and spaces, and thereby, assist them to integrate productively into society. Meanwhile, across town, another friend was in a genuine dilemma about how he would go to work, after an old back injury flared up. In particular, it was difficult to climb stairs, and since there were no handrails outside his office and the steps were quite steep, he had to forego several days work (and income), until he could be sure he could manage. He too, worried about how he might stand up from the very low office toilet. Even if you are embarrassed about all this talk of toilets, you, no doubt, understand their significance to a happy and healthy social life. Imagine what your life might be like, if the only toilet you could ever use was the one in your home. Could you go to work? Could you go on holiday? Could you go to a family wedding? But toilets are just a piece of the accessibility puzzle. Imagine your indignity, if a security guard sat outside the local post office, bank, hotel room, cricket stadium, eatery, bus or market and told you that you were not allowed to enter, even though he let other people in. It might sound unlikely, but this is effectively what happens every day to thousands of people with mobility impairments. Only, it is not a security guard turning them away, it is an architect, engineer, town planner, politician, manager or the average citizen who has placed an obstacle in their way. Interestingly, Sri Lanka has had legislation designed to combat such problems in place for almost 15 years. This includes physical access standards with specific measures designed to remove these barriers, although these latter guidelines were only legislated in 2005. Yet, despite the talk of equal opportunities, there is little evidence to show that people with mobility problems have the opportunity to physically access places in their communities. This is a significant oversight, since physical access is often considered a pre-cursor to other opportunities such as employment and education. After all, if you cannot get to or into the building, how can you get a job there? “The problem is that legislation is not being enforced,” says Dr Ajith Perera, a former Test cricket umpire with a PhD in Chemistry, who became a disability activist following personal adversity. “You know, if the police catch a person drink-driving or speeding, he is immediately fined. But if a person puts up a building that violates the laws of this country, adherence to which will bring a wide range of benefits to the people and the country, there is no punishment. But it certainly punishes us!” exclaims Dr Perera. Dr Perera is the man who filed the Supreme Court petition. He resorted to this action after years of sitting on various committees and lobbying for implementation with no result. These committees include those made up of government officials, businessmen, and civilians, meaning, inaction exists despite the fact that politicians and key decision makers are well aware of the existence of the legislation, with some even sitting on high level councils chartered with furthering equal opportunities for people with disabilities. Dr Perera calls this inaction a national crime, pointing out that it has discriminated against or marginalised millions of people, making them virtual prisoners in their homes. “People cannot find jobs, if they cannot get into the offices or use a toilet. They cannot deposit money in banks, if they cannot get in. They cannot even spend their money, if shops or restaurants put obstacles in their way,” says Dr Perera. Dr Perera estimates his case is relevant to a minimum of three million others in the country, who are prevented from accessing or suffer loss of dignity or danger to their safety, when trying to use public facilities, in the hope that justice will be served. This three million includes thousands, nobody knows for sure how many, of soldiers injured in battle. Major Anil Seneviratne is one such soldier. He lost a limb serving his country, and now acts as the CEO of a community based disability organisation in Tangalle, Navajeevena. In an interview with The Nation, Major Seneviratne spoke of the ‘insult’ to a soldier’s pride, at having to face the indignity of being helped or being denied access to public facilities, after fighting for the protection of their country and its people. “It is an insult that the environment that we build to live in does not include the disabled. It is a dishonour to those proud citizens,” says Major Seneviratne. “It is true that disability changes your whole lifestyle, behaviour, and hopes; but it does not and should not erase ones beliefs – especially, core beliefs of a sense of self-pride. Therefore, it is much needed to enforce laws and create an attitude that considers their pride and dignity, if you really want to respect them as heroes.” (Read more of what Major Seneviratne had to say in Box). The period after a major war, has been a time for positive changes for people with disabilities worldwide, as injured and disabled soldiers return home to re-integrate into society. 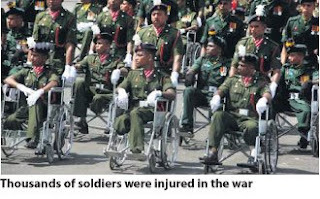 In Sri Lanka, these disabled war heroes are likely to face hardship, if these laws do not get enforced without further delay. While most of them will still be ‘fighting fit’, they may encounter more difficulty attending their sister’s wedding, than crawling across the battlefield. Dr Perera has had opportunities to talk with some of these Ranaviru soldiers, facing the new battle for their Rights for a dignified and productive integration into society. “But what some of them have been telling me is that they are really afraid that people will just take pity on them and see them as charity cases, especially, if they have to be helped into a buildings in day-to-day life,” says Dr Perera. Dr Perera is hoping that a favourable Supreme Court decision will help people see the accessibility issue as one of justice rather than charity. He feels that, often, the only reason there are some accessible features in the country is because people feel it is charitable to help people with disabilities, rather than understanding it as a legal right and moral duty. Dr Perera also points out that, this charity mindset often leads to people putting up ramps and facilities that are unsuitable, since they fail to get the correct advice from those who have the practical experience or consult the relevant guidelines. Apparently, they think any type of ramp will do, and do not realise that, it is essential to meet certain requirements. The lack of enforcement compounds the problem, since no one is checking that people do the job right or do it at all, according to Dr Perera. He also points out that, it leads to time, effort and money wasted, since a ramp that is built wrong, will be just as inaccessible as no ramp at all or, even dangerous to use. Dr. Perera and Major Seneviratne both empahsise that this legislation is, effectively, to help the entire population, since accessible premises are more convenient and safer for everyone. “People say it only affects 3% or 4% of the population, so why should we spend money on such a small number of people? But what about the elderly people, people with arthritis, people with heart conditions, diabetes, obesity or temporary illnesses?” asks Perera, who adds that, such low estimates of disability have in any case been discredited. And he is right. In a recent study, the World Bank predicted the number of people considered elderly, set to make up a quarter of the population in the next few decades. Moreover, the number of elderly people, who are physically disabled is further predicted to make up one third of the elderly population within the next few decades. There is a truth in Buddhism about impermanence, that points out we cannot escape growing old, we cannot escape the decay of ourselves or the people around us, and we cannot escape ill-health. With this in mind, for those of us who hope to lead fulfilling lives amongst our communities throughout our lifespan, accessibility certainly becomes everybody’s business. Here is hoping, we see some action. The Nation spoke with Major Anil Seneviratne, who was injured during the war and lost a limb. He is now the CEO of Navajeevena, a Tangalle based organisation that has been serving disabled people for many years. Thousands of soldiers have given their limbs to help defeat terrorism in Sri Lanka. They were previously toughing it out in the dense jungles and difficult conditions on the battlefield, but now, it seems that many of them—while still young and fit—are prevented from entering the public buildings of this country, because of thoughtless design. Yes, I think the topic is both current and timeless. My opinions on this issue have developed as a soldier, a person wounded in the field, a disabled person, a private sector employee, and a disabled Rights activist. We have to admit the fact that the number of disabled persons has now increased due to a three-decade-long war. Most of the soldiers, who have been injured, are young and strong. And, although it is unintentional, it is indeed a sad situation to see that those people are now not included in the mainstream. This is due to a lack of anticipation as a nation, and a lack of caring for marginalised communities, by society. Those young people still have responsibilities to their families and loved ones. They still have a role to play in their family and in society, and to do this, need to access buildings and public facilities often. If the environment is not ready to accept them, it makes them frustrated, which can end up with them developing hatred towards society. A disability is, anyway, an unpleasant thing that no one likes to have. So, the environment should be modified in such a way that such difficulties can be reduced. And, actually, whether you are a soldier or not, once disabled, the needs are common. We are moving towards an inclusive society, and physical accessibility is the key to an inclusive society. People also fail to realise that, when we afford accessiblity for the disabled, we are making it easier and safer for everybody to use. And, you know, the other thing is, if society does not consider disabled people, that means, society neglects a potentially lucrative consumer market. How do soldiers feel, when, though they are considered war heroes, they are not supported in their basic Rights for accessibility, that are the laws of the land? There is another sensitive and little spoken of aspect of those individuals. That is, not everyone can be a soldier. A soldier is a person who places his self-esteem over his life. I still remember the motto of my troops; “Death before Dishonour”. It is an insult that the environment that we build to live in does not include the disabled. It is a dishonour to those proud citizens. It is true that the disability changes your whole lifestyle, behaviour, and hopes; but it does not and should not erase ones beliefs – especially, core beliefs of a sense of self-esteem. Therefore, it is much needed to enforce laws and create an attitude that considers their pride and dignity, if you really want to respect them as heroes. What are some of the common issues disabled soldiers face with regards to accessibility? There are many, and their needs are just like other citizens. But some of the common ones include: using public transport, using roads, accessing water and sanitation, getting into public and private buildings and using its facilities or services, moving around their own houses – especially, the toilet facilities, problems in the workplace, and isolation due to inability to use common facilities that everyone else in the community can. From The Vancouver Sun in Canada. 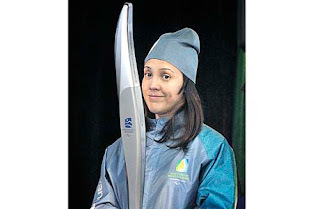 In the picture, Paralympian Karolina Wisniewska models the Paralympic torch and the torchbearers uniform for the 2010 Vancouver Paralympic Games torch relay. From the seats of their wheelchairs, International Paralympic Committee president Sir Philip Craven and retired Canadian sit-skier Brad Leanna told two different, but equally meaningful, stories June 25 about their torch relay experiences. They were speaking as Vanoc unveiled the metre-long grey torch that will be used for the 2010 Paralympic relay that will start in Ottawa on March 3 and arrive in Vancouver 10 days later. Craven, the ex-wheelchair basketball player from Great Britain, said one of his most memorable turns with the torch came in Salt Lake City in 2002 at an adventure playground for kids. "I nearly killed myself," cracked the jovial Craven. I became a kid and I was going at full speed and I thought the torch was going to come out of its holder. I nearly ended up in a sandpit, but I didn't. I just made it around the corner." Leanna was one of 10 Canadians chosen to carry the torch for 50 metres in Beijing in 2008. Dressed Thursday in the 2010 Paralympic uniform — steel blue and accented with bright bursts of blue and green on the jacket's left arm, was Vanoc's description; Mr. Blackwell just rolled over in his grave — Leanna said the Beijing experience was almost overwhelming. "I took a moment to think to myself, 'Wow, out of all the people in the world right now, I'm holding the Paralympic flame . . . and all that represents. It's a pretty powerful feeling." Leanna said he'd love to be one of the 600 who will get a chance to wheel or run with the torch in Canada. Just who will have the opportunity to live that moment — and the opportunity to plunk down $349 to buy the Bombardier-made torch he/she carries — is unknown, however. The organizing committee for the Vancouver 2010 Olympic and Paralympic Games unveiled only four things on Thursday: the torch design — a darker version of the Olympic torch, it looks like a runner off a decades-old sled; the emblem for the Paralympic torch relay; the torchbearers' uniform; and the start point for the relay. How will Ottawa possibly match the ancient Temple of Heaven in Beijing for the lighting ceremony? There was no information on how the torchbearers will be chosen or how the public can sign up. No route information, celebration sites or whether communities across the country can even lobby to have the relay run through their town. "We're working through those elements of the program right now and we'll come out with an announcement later in the summer, beginning of the fall," said Jim Richards, who is in charge of torch relays for Vanoc. "We're working with our partners on the best way to approach this and what is it that meets our objective in terms of really finding those inspirational stories. We want to make sure we tap into those." He did say the torchbearers will be a combination of able-bodied and disabled Canadians. The torch relay emblem, by the way, is described this way in a Vanoc release: " 'Spark Becomes Flame' shows a human figure with its arms raised and joined, much like a candle's flame. Contained within the arms is the glow of the fire within everyone, symbolizing the moment when imaginations are ignited and dreams born." Since no Paralympic Games were held in Canada following the 1976 Montreal Summer Olympics or the 1988 Calgary Winter Olympics, this will be the first Paralympic torch relay held in this country. Given there are only 10 days available for the relay, it will not be able to take an uninterrupted linear route. "We're going to have to pick it up and move it and . . . create those positive moments, those wonderful stories," said Richards. "We want to build a story and build excitement for the Games." There's no need for more research into a possible link between vaccines and autism. But there is a continuing need for support of ongoing research into the true etiology of autism and its treatment. And physicians should continue to take a lead role in extolling the benefits of vaccines to health policymakers and the public. Those were among the messages recently sent by the AMA House of Delegates, which met June 13-17 in Chicago. -- urged the association to continue to support research into the etiology and treatment of autism. Although delegates at the meeting overwhelmingly supported the first and third resolves, they steadfastly opposed the request for a council review of vaccine research. California delegate and internist Melvyn Sterling, M.D., testified during a June 14 reference committee hearing that sufficient research on vaccines and autism already exists and clearly demonstrates the two are not linked. "The science is compelling," said Sterling, who is a past chair of the AMA Council on Scientific Affairs, the precursor to the Council on Science and Public Health. "There's no reason to reinvent the wheel." The reference committee agreed, concluding in its report that, "the relationship between vaccines and autism has been extensively studied by many scientific organizations, including the Institute of Medicine, and that further study by the AMA on this issue was not necessary." That view was upheld earlier this year in the courts, when, in February, three federal judges ruled in three separate cases that there is no association between vaccines and autism. The reference committee did recommend for adoption a substitute resolve that urges the AMA to continue to work with immunization advocacy groups to help physicians communicate to patients, parents, policymakers and the media that vaccines do not cause autism and that falling immunization rates have led to a resurgence of vaccine-preventable diseases and deaths. Outbreaks of Haemophilus influenzae type b, or Hib, disease reported earlier this year in Minnesota and Pennsylvania, as well as a series of measles outbreaks across multiple states, serve as stark reminders of the ease with which vaccine-preventable diseases can reassert themselves in un- or underimmunized populations. Meanwhile, another resolution related to vaccines was referred for decision after reference committee testimony was deemed inconclusive. That resolution, crafted by the California delegation, called on the AMA to encourage redistribution of state and federally funded influenza vaccine that stands to go unused to facilities willing to manage and distribute the vaccine for free to patients and physicians in poor and medically underserved areas. The resolution also directed the AMA to work with other public health organizations to address issues of vaccine distribution. AAP delegate Carol Berkowitz, M.D., testified that more information was needed to understand the impact of the resolution, and Rear Adm. Anne Schuchat, M.D., director of the CDC's National Center for Immunization and Respiratory Diseases, cited concerns about the limitations of the federal flu vaccine distribution system. Other speakers were apprehensive about vaccine being distributed based on socioeconomic status. Against the backdrop of the recent decision by World Health Organization officials to declare the novel influenza A (H1N1) outbreak an outright pandemic, the AMA house adopted two substitute resolutions related to pandemic preparedness. The first resolution directs the AMA to urge HHS, the CDC, and state and local health departments to urgently assess shortfalls in funding, staffing, and vaccine, drug and data management capacity to prepare for and respond to an influenza pandemic or other public health emergencies. The resolution also calls for the AMA to urge President Obama and Congress to provide the funding and resources public health agencies would need in such an event, a need highlighted in a recent report from the Trust for America's Health that detailed numerous gaps in the nation's level of pandemic preparedness, including an inadequate public health workforce and insufficient domestic vaccine production capacity. The second resolution asks the AMA to urge the CDC to develop and disseminate electronic instructional resources laying out procedures for physicians to follow in a pandemic or other public health emergencies. Lawyers for three children with Down syndrome have sued in federal court to stop the state from cutting the hours of in-home care they receive. The reduction in care is slated to begin July 1 as part of sweeping budget cuts throughout the state Department of Social and Health Services (DSHS). The plaintiffs maintain budget problems cannot legally be used as justification for cutting back the hours of care the children receive. Caretakers for the young people — who range in age from 14 to 20 and receive Medicaid benefits — were notified last week that the state was cutting the number of hours they would be able to give their clients each month, the lawsuit says. The caretakers are paid with federal Medicaid funds that are administered by the state. Down syndrome is a genetic chromosomal disorder that results in an array of symptoms including mental impairment. According to DSHS, the cuts would affect approximately 3,100 disabled children and save the state about $3 million over two years. According to the lawsuit, filed Wednesday, the plaintiffs have disabilities so severe they would be eligible for placement in state institutions if they were not cared for at home. The suit says the children's parents and guardians already save the state money by assuming responsibility for their care. The families depend on relief by Medicaid-funded providers who come to their homes to help with the children's care, the suit says. According to the lawsuit, the children's parents and guardians were notified by letter that each child would lose from two to seven hours of Medicaid-funded assistance per month. Each child currently receives between 72 and 141 hours of in-home assistance each month. "These cuts will hurt children with serious disabilities and the family that is doing its very best to take care of those children at home," said the plaintiffs' attorney, Amy Crewdson. According to the lawsuit, the state specifically acknowledged in letters to the children's caretakers that the cuts were being made because of budget problems. Under federal law, the state can make cuts to these Medicaid recipients only when individual assessments indicate their needs have changed and that reduced services are appropriate, according to the suit. "The Department of Social and Health Services assessed every one of these children to determine what amount of Medicaid-funded in-home personal-care help the state would provide," said Crewdson. "Now, DSHS is cutting every child's hours, not because a new assessment was conducted or the child's needs changed, but because of the state's budget." Kathy Leitch, assistant secretary for Aging and Disability Services with DSHS, said the cuts are an unfortunate but unavoidable result of the economic crisis that has reduced the state's budget for the next biennium by billions of dollars. "The budget situation that the state has been facing is unprecedented, and we know that reductions in service are upsetting to consumers, advocates and providers," Leitch said. She said the state has recognized that lawsuits might be filed in response to the cuts. Leitch said that if the plaintiffs prevail, the state may have to cut services to other vulnerable people. A court hearing has been set for June 29. Sheryl Meeuwsen's college career started with such promise — a scholarship to the University of Massachusetts at Amherst. "It went downhill from there," she says. "I ended up failing out. Moved in with an aunt and uncle in Colorado Springs. Failed out of Pikes Peak Community College. I had no idea there was anything wrong with me." By the time Meeuwsen, then 20, was diagnosed last year with Asperger's syndrome — an autistic spectrum disorder that ordinarily allows those who have it to function at a high level — she was scraping bottom, unable to figure out why things had gone so wrong. Just over a decade ago a flood of children with autistic spectrum disorders began entering regular classrooms, mainstreamed under new and significantly more forward-thinking federal regulations. They were given individualized education programs — or IEPs — that played to their strengths, helped them compensate for their weaknesses, and gave them advocates to help steer through challenges. A number of specialized elementary and secondary schools, including Moraga's Orion Academy and Lafayette's Springstone, sprang up as well. Now, those youths are starting to age out of that protective, well-supported academic environment and head off to college. And many of them are struggling. All the challenges of freshman year are multiplied 500-fold when you're also dealing with autistic spectrum disorders, says Janet Miller, director of Berkeley's two-year-old College Internship Program for young adults with Asperger's and similar disabilities. It's not a question of intelligence. It's regular life they have difficulty with — getting up in the morning, prioritizing tasks, and taking care of themselves. Autism affects executive functioning, the brain's ability to process the overwhelming surge of information that streams through our lives every moment. They have trouble interpreting events and social cues, and formulating an appropriate response. "More and more I saw a problem that repeats itself," says Miller, who came to Berkeley from Menlo College's disability services department. "There's a semester, perhaps a year, where they tried it the traditional way. Socially, they couldn't do it. You don't have the advocacy of an IEP team." And a heart-rending cycle begins. Conventional college is a disaster, so the teen lands back at home, trying to take classes at a community college, and becoming ever more socially isolated. Instead of moving forward, he goes backward. That was the fear for Jason Kanar and his family. Kanar had spent two years as a mechanical engineering major at UC Merced, trying to tough it out. "By fourth semester," he says, "we realized we had to do something else." There was absolutely nothing wrong with Kanar's intellect. It was everything else that was the problem. "It's not so much needing help with subjects, it's just getting started," he says. "If I don't explicitly put out time for certain things, it doesn't happen. It's about doing it all, the cooking, the cleaning, the being on time for class." Back home in the Danville area, Kanar's family began researching other options, alternatives that would bridge the gap between the protected, special education environment of high school and the challenges of university life. Frankly, there just aren't many. In the waning weeks of last summer, as Kanar tried to hold down a job at a Target store and figure out his life, his parents chanced upon this new program in Berkeley, the latest incarnation in psychologist Michael McManmon's 25-year-old vision of college internship programs, which started in Massachusetts. The inside joke is that the Berkeley site was chosen for its alphabetical appeal — the other programs are at the Berkshire center in Massachusetts, the Brevard Center in Florida, and the Bloomington Center in Indiana. But in truth, Miller says, Berkeley's combination of academics and city life, its public transit system, and the soaring statistics on autistic spectrum disorder cases on the West Coast made it a natural choice. In California, some 1,977 youths, ages 14 to 21, with autistic spectrum diagnoses were enrolled in public schools in 2000. By 2008, the number had risen to 11,816. "The need has been endless," she says, "but there was nowhere to go." Now the program has expanded to include a summer session for high school students with Asperger's on the UC Berkeley campus, as well as the orientation program for incoming first years that starts in mid-July. Some of the program's students are like Kanar, Bay Area born and bred. Others have traveled a considerable distance, physically and emotionally, to arrive here. "I came here in complete denial," Meeuwsen confesses. That denial evaporated when she came across an Asperger's symptom checklist and found herself uttering a surprised little "Oh!" at every question. Suddenly, there was an explanation for her difficulties and, more importantly, help. "Definitely, the fact that there's been a name for it has been the most helpful," she says. "I was so isolated in high school. I've come so fully out of my shell. I'm an honor student, the president of the student senate here." Kanar, Meeuwsen and their classmates spend much of their days together. Students share two-bedroom apartments in downtown Berkeley, cook cooperatively and attend morning classes together. Each day starts with a reframing exercise, and a series of questions — am I hungry, tired, angry, depressed, anxious? — that serves as a sensory check-in. Students grade themselves in each area and discuss how they might cope by getting more sleep, eating a better breakfast or being more gentle and forgiving with themselves. It's an exercise, Miller notes, that might stand everyone in good stead, not just these young adults. There are tutoring sessions, social peer counseling, and career and executive functioning classes, none of which carry a small price tag, not with a staff-student ratio of one to one. About 95 percent of the California students' tuition is covered by Regional Center funding — the same funding that helped cover their special education costs in high school. For actual classwork they head off to lecture halls at Berkeley City College, Holy Names, Peralta College and other local campuses. Meeuwsen takes an online European history class and a psychology class at Berkeley City College, and volunteers at Alta Bates hospital. Kanar is studying multivariable calculus, English and sound design. On weekends, they strike out for other areas — Point Reyes, for example, or the tea garden in Golden Gate Park — with friends. Sundays are "Grill and Chill Nights," when students fire up the barbecue and hang out. "They haven't had much of this sort of thing," says CIP marketing coordinator Dan McManmon, "this big group of friends." And the difference it makes in a young adult's life can be profound, he says. It's not just about academic success, or modern survival skills. It's about learning to thrive independently. Every child should have the opportunity to go to summer camp, but the economy is making that difficult for many hard of hearing and deaf kids in Indiana. The Indiana Deaf Camp at Camp Mack in Milford, is the only camp of its kind left in the state. For many campers, like 13 year old Alyssa Barrett this camp is something they look forward to all year. Barrett says, "I was scared at first, but I met friends and some people who had experienced here and they helped me, and then I was able to fit right in." More than 150 kids will attend this year's camp, the largest number since the camp started in 1973. Through business and personal donations, the camp helps pay for children, who otherwise couldn't afford it. Camp Director Phil Harden says, "When they come here, they will learn and see other people that are the same as them, and when they grow say I can become a confident deaf person." Kids at this summer camp get to enjoy all the same activities like other camps, but Barrett says what makes this camp special are the friendships she forms here. "My first time I came I saw many deaf signing and I met new friends and they talked all day long" says Barrett. She says the donors who support the camp have given her life experiences she'll never forget, and she's grateful to them, "Maybe they can come visit and see for yourself and see what your support does for the kids"
This year's Indiana Deaf Camp will be July 5th through the 10th at Camp Alexander Mack in Milford. A 15-year-old boy with mental disabilities is in critical but stable condition at ECMC today after being hit by a train yesterday. The teen was participating in a Challenged Athletes Participating In Sports baseball game near Main and Fuller Streets in the City of Tonawanda. He and another individual from the same group home were being supervised by two staff members from People Inc. Somehow, the teen made it up a hill to the nearby train tracks. The engineer and the conductor told police that they had rounded the bend and noticed someone between the tracks. They blew the whistle to alert him to move, but police say the crew felt that blowing the whistle attracted him closer to the train. He was struck, and is now in the trauma unit at ECMC with several fractures. People Inc., who had two staff members supervising the teen, is conducting an investigation along with the Office of Mental Retardation and Developmental Disabilities. They are also in contact with the teen's family. Despite the incident, People Inc. says it will continue to bring individuals in its programs to community events throughout the summer because community interaction and integration is one of the agency's main goals. Ten years after a Supreme Court decision that essentially outlawed institutionalizing people with intellectual disabilities, a Pennsylvania advocacy group has filed a lawsuit against the state’s department of Public Welfare - claiming they are not providing the community-based care mandated by the law. The suit was filed by the Disability Rights Network of Pennsylvania on behalf of the over 1200 people still living in state-run institutions. It states that community based care provides better choices for people with disabilities, and is more cost-effective. Suroviec: I have never met a person with mental retardation who could not live in the community. If they had access to community supports and services, they could live either in their own home, in an apartment, in a group home, with family and friends and neighbors like anyone else. Suroviec says services would include help with household chores and transportation. Kreider: It’s not just general slots that they would move people in, it’s slots that have to be designed specifically for the specific needs of the individuals. Kreider: Almost all the states are viewed as significantly out of compliance by the disabilities community, because progress has been slow. And over the last two years as the budgets, the state budgets have become more difficult, this has ground almost to a halt. Pennsylvania’s Department of Public Welfare declined to comment on the pending law suit. In recent years, the military has invested millions of dollars in mental health care, fueling a proliferation of treatment programs while attempting to reshape fundamental attitudes about mental illness. But the stigma persists among the rank-and-file, keeping many troubled soldiers from taking advantage of help that is readily available, according to two Army generals. The Army's top psychiatrist, Brig. Gen. Loree K. Sutton, and Fort Carson commander Maj. Gen. Mark A. Graham spoke with reporters, civilian health care providers and others Wednesday as part of an Army-sponsored Warrior Care Summit in Colorado Springs. A 2007 scandal at Walter Reed Army Medical Center that revealed widespread medical neglect, coupled with a rash of soldier suicides and homicides, has led to major strides in how the military approaches health care. Sutton described the Walter Reed revelation as a tragic "blessing." "We're really good at the life-saving, white-knuckled, adrenaline-charged stuff," she said about the military's medical team. But until recently, the military fell short when it came to taking care of soldiers coming off the battlefield or in need of longtime rehab. This "cultural transformation," Sutton said, has changed medical protocols to place a greater focus on the "whole" soldier. Mental health, she said, is now taken as seriously as physical health. Her job title might serve as an example. She is the founding director of the Defense Centers of Excellence for Psychological Health and Traumatic Brain Injury, a Defense Department organization charged exclusively with addressing the psychological needs of the military. The changes aren't just at the top. Platoon leaders and medics, for example, are being trained to recognize signs of stress among their troops and to help those soldiers get help. Army doctors and counselors have honed their questions to better identify conditions such as post-traumatic stress disorder and traumatic brain injuries. Fort Carson recently opened a center designed solely to help soldiers with traumatic brain injuries. Yet such efforts are hampered by a tough-guy culture where words such as "stress" and "mental health" make people bristle. Graham said soldiers fear that if they seek psychological help, it might be seen as a sign of weakness and could jeopardize promotions or admission into selective programs. Graham is a vocal advocate in addressing those stigmas. One of his two sons committed suicide, and the other died in combat in Iraq. And at Fort Carson, 14 soldiers were accused or convicted of homicides from 2005-08, he said. "We take it very hard when a soldier goes downtown and does something horrific," he said. The question, he said: "How do we see that red flag?" One of Sutton's strategies is a new $1.8 million public awareness campaign built largely on telling the stories of soldiers who sought help. Paralyzed boy to gunman: "I forgive you"